The Adventist Development and Relief Agency (ADRA) was started by the Seventh-day Adventist Church as a way to follow Christ’s example of serving and caring for those in need. Put simply, ADRA improves the lives of people around the world. The agency searches out deprivation, social injustice, and need—then works to eliminate them. Brief History In May of 1950, approximately 100 pastors and missionaries were led of God to begin a new fundamental, missionary, Baptist movement that would emphasize a worldwide church planting ministry. A simple fellowship of pastors was formed. In the years that have passed since those early days, it has grown dramatically; HOWEVER, it has never deviated from the purpose for which it was founded; to train, equip and support people for the ministry of establishing local Baptist churches around the world. Today, those original 100 have grown into the largest independent Baptist Missionary organization in the world. 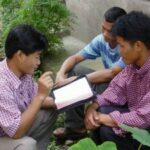 What We Do — BCM International is a global Bible-Centered Ministry dedicated to making disciples of all age groups for the Lord Jesus Christ through evangelism, teaching and training so that churches are established and The Church strengthened. We have three core ministry focuses: Children’s Ministries, Church Development, and Leader & Teacher Training. The mission of Christian Associates is to establish churches who follow Jesus in transforming their world: We are called to be his missional followers. Thus, by God’s grace and the Holy Spirit’s empowerment, we want to foster a great movement that has a tireless passion to plant the Gospel and invite others into a relationship with Jesus and join us in his mission to the world. The mission of Jesus Film Harvest Partners (JFHP) is to share God’s love with the lost, to help fulfill the Great Commission. They partner with other Kingdom ministries to make Christ-like disciples in the nations. The JESUS Film has been acclaimed as one of the greatest evangelistic tools of all time. Since 1979 the “JESUS” film has been viewed by several billion people, with 225 million indicating decisions to follow Jesus. The Church of the Nazarene has no greater mission than reaching those who do not yet know Jesus Christ as Savior and Lord and then helping them become Christ-like disciples. Operation Mobilisation’s role in the Church is to mobilise people to share the knowledge of Jesus and His love with every generation in every nation.